On the JSE, index heavyweight Naspers [JSE:NPN] was the biggest contributor to the bourse’s downside as it lost 3.18% to close at R3050.00. Reinet Investments [JSE:RNI] also struggled as it shed 2.44% to close at R208.66, while tobacco giant, British American Tobacco [JSE:BTI] retreated to close at R448.74 after dropping 1.96%. Sappi [JSE:SAP] pulled back to close 1.43% weaker at R76.69, while Rand Merchant Investment Holdings [JSE:RMI] closed 0.54% weaker at R37.17. Bankers also traded softer despite the rand trading mostly flat. Standard Bank [JSE:SBK] pulled back to close at R184.64 after dropping 0.33%, while Nedbank [JSE:NED] lost 0.75% to close at R274.23. Aspen [JSE:APN] recorded a third consecutive session of gains to end the day 6.16% higher at R156.43. Imperial Logistics [JSE:IPL] rallied 5.46% to close at R72.43, while Motus Holdings [JSE:MTH] firmed to R92.70 after adding 2.43%. Platinum miner, Northam Platinum [JSE:NHM] firmed on the back of mildly stronger platinum metal prices which saw the stock add 4.61% to close at R46.50, while Anglo American Platinum [JSE:AMS] gained 2.32% to close at R592.47. Massmart [JSE:MSM] recorded a minor rebound following Tuesday slump as the stock gained 4.11% to close at R94.38. Pioneer Foods [JSE:PNR] held on to its gains to end the day 1.76% firmer at R83.21. 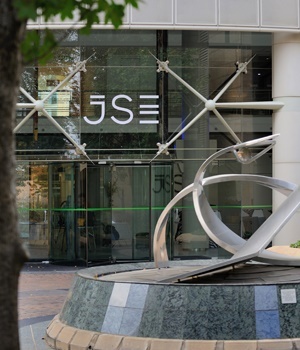 The JSE All-Share index eventually closed 0.42% weaker while the blue-chip JSE Top-40 index lost 0.56%. The Industrials index was the only major index to close in the red as it lost 0.97%. The Financials and Resources indices managed gains of 0.32% and 0.17% respectively. At 17.00 CAT, Gold was down 0.42% at $1279.83/Oz, Platinum was 0.05% weaker at $791.45/Oz, and Palladium was 0.29% softer at $1345.29/Oz. Brent crude traded mixed on the day, however it was trading 0.34% firmer at $61.71/barrel just after the JSE close. At 17.00 CAT, Bitcoin was flat to trade at $3631.80/coin, while Ethereum was down 0.43% at $119.55/coin.